When I first moved to Toronto, to work full-time after university, I lived in a 2-bedroom apartment on Dunfield Avenue, just east of Yonge and Eglinton. Back then, the moniker for the area was ‘Young and Eligible’. Eglinton station was my reliable gateway to the rest of the city. I shared the apartment with a genial couple named Jeff and Kirsten, who sublet their extra bedroom to me. They worked in finance and rigorously kept to an early-rising, early-to-bed schedule — so I hardly ever saw them, save for an hour or two in the evenings. They were tidy, amiable, and quiet roommates. It was an ideal setup. Plus, I worked right up at Lawrence, so I could hop over to Eglinton, grab one of those ridiculous Cinnabons whose aroma wafts everywhere in the station, ride one stop north, and be at work in no time flat! Not that I wasn’t constantly late anyway. The glossy Vitrolite tiles of Eglinton, still extant. The station has undergone many alterations since it opened as the northern terminus of the Yonge subway. The medium-term future holds even more change, driven by the significant development and intensification surrounding the intersection of Yonge and Eglinton. The connection to the Crosstown line means that the entire subway platform will be extended northwards; I hope that at least some of the Vitrolite tiling survives the process. 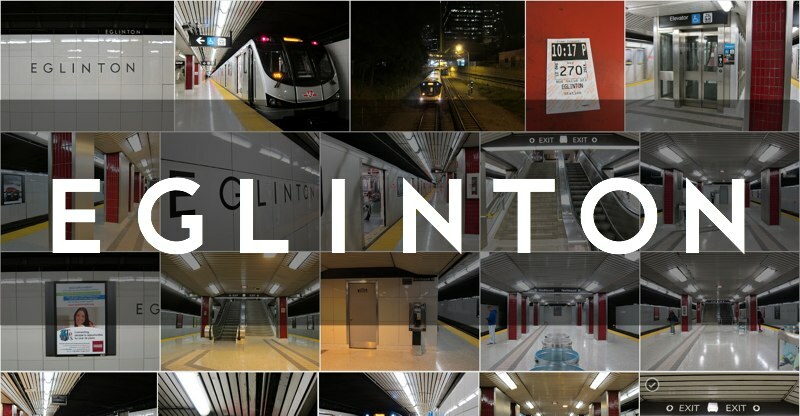 Have you ever shopped in the concourse at Eglinton? Eglinton opened on March 30, 1954. I recommend reading Transit Toronto’s history of this important station, once the aggregation point for feeder bus routes across the suburbs from the north, east and west. A dozen years from now, perhaps my own gallery of photographs will be equally useful in recalling ‘what the station looked like in 2015’. Buses jockeying through the ‘temporary’ bus platform at Eglinton. Ten years and counting is a long time for temporary. The dénouement of my tale is rather subdued, yet gratifying: About a year after I moved in, my roommates became pregnant, and my room was needed for the incoming baby. So I had to move out, and I bid a reluctant farewell to the neighbourhood. C’est la vie!